ISRAEL. 1997. Music & Dance Festivals Set. SG: 1371/73. Mint Never Hinged. 'Mint" is unused stamp and hinged. 'NH' is mint never hinged. 'NC' is not counted. The marked value was done long ago and out of date. With 40,000 or more new images every week,we only keep the images for one week after the item was sold. IMAGES are Provided for ALL the SHEETS in this LOT ! Majority of pages are empty. We will do our best to solve the problem. 1914 Jerusalem-Denver Franked Turkey. Violet Jerusalem Cancel. 1914 Jerusalem-Denver Franked Turkey. Violet Jerusalem Cancel.. Shipped with USPS First Class Package. Mayfairstamps Israel 1959 Memorial Day Holocaust Victims Cover. We will combine shipping for Purchases. It is 10 cents for each additional item within the US & 25 cents for each additional item outside of the US. Please note that this does not apply to collections. Please wait for a combined invoice before making payment. Feel free to contact us if you have any questions. Please send all messages through eBay's messaging system. (Strip with 5 values (5v Strip). 3) Select each item and 'Add to Basket'. IMAGES are Provided for ALL(-1960) the COVERS in this LOT ! Each horizontal row have 2 coded tabs with serial numbers at left side. This sheet with coded H I which was in used for Holland. 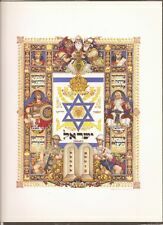 The design itself is a Star of David containing the word "Zion" in Hebrew. Mint never hinged. Good condition. Joel Weinstein, PO Box 3313, Torrance California 90510-3313. Israel Judaica KKL JNF (Jewish national Fund) - 1926 contribution stamp from the " Leaders of the Jewish renaissance " issue. This stamp showing Yechiel Tchelnoff. Rochlin Catalog # A33. Mint never hinged. Mayfairstamps Israel 1967 Tours to West Bank United Tours LTD Cover. We will combine shipping for Purchases. It is 10 cents for each additional item within the US & 25 cents for each additional item outside of the US. Please note that this does not apply to collections. Please wait for a combined invoice before making payment. Feel free to contact us if you have any questions. Please send all messages through eBay's messaging system. Each horizontal row have 2 coded tabs with serial numbers at left side. The design itself is a Star of David containing the word "Zion" in Hebrew. 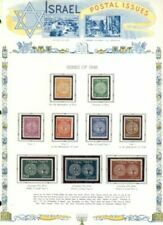 This sheet is mint without gum as issued & due to the large size, with few folds in perforations. Israele 1950 II anniversario dello Stato serie cpl nuova gomma integra (MNH) con appendice completa (N608). 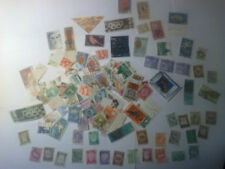 Israel - Accumulation of commercial & philatelic covers & cards. See pics below. 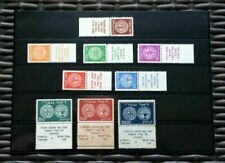 Substantial Israel Full Sheet Collection 1950s->70s 182 MNH Mint Stamp Sheets! I.26 stamp featuring Chaim Nachman Bialik and Theodor Herzl. Haifa cancellation. Israel: Interim Period. except for photographic matter because it can be so easily copied. 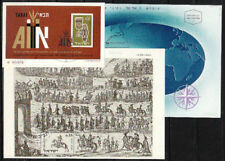 All the tabs and souvenir sheets issued for the year in VF MNH condition. Israel Full Sheets of 100 x 5 MNH Mint Scott #106, 108, 109, 110, 113 1956 LOOK!